28 popular sizes moulded in ABS polymer and Polycarbonate which offers high impact strength, light weight and resistance to corrosion. Available with RFI shielding for EMC compliance. CEM enclosures are moulded from either ABS polymer or polycarbonate. They are lightweight and offer high impact resistance, making them ideal for housing electrical and electronic equipment. 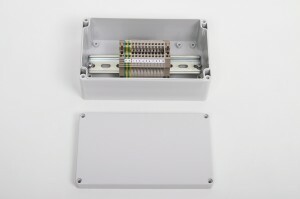 With wall thickness of up to 4mm CEMs are more rugged than many other plastic enclosures. Available in 28 popular sizes, CEM’s ‘shoe box’ design makes it aesthetically suitable for a wide range of applications where the final product is required to have a quality appearance. Typical applications include: measurement control, housing sensors, for tracking and monitoring equipment, terminal junction boxes, lighting and luminary control and many more. All CEM enclosures are available with polycarbonate clear lids, allowing components like data displays to be visible. CEM protection class: IP66 as standard and IP67 at additional cost. CEM’s have a -40ºC to +80ºC temperature range as standard on both ABS and polycarbonate enclosures. -50ºC to +120ºC temperature range is available with a silicone gasket on CEM polycarbonate enclosures. Available in light grey (RAL 7035) as standard. Other colours, to customer specifications, are available on request. RFI shielding for EMC compliance and screen printing options are also available. Various accessories such as mounting plates, external hinges, mounting feet, and wire lock screws are all available at additional cost.